We don't just supply ingredients...we provide solutions. At KaTech, we formulate a product and process specific solution designed to improve and add value to our customers’ recipe formulations. Our approach is to develop a portfolio of raw materials and complemented by our technical competence build a value based knowledge bank. It is through this knowledge and understanding of global raw materials that we are able to provide the best technical and commercial solutions available. We have an extensive view of the complete raw material market and can offer completely independent views. This allows us to bring new raw material functionalities to market quickly and ensure that the supply is secure and cost effective. We source and use the highest quality of raw materials and look to use both sustainable and ethical sources where possible. So if you are looking to bring a new product to market, reduce associated costs, or have a problem product, KaTech can help. By use of: Alginates, carrageenan, gelatine and pectins. For use in: Dairy products, fillings, dressings, aerated products like mousse or cream toppings, fruit products or drinks. By use of: e.g. pectins, cellulose gum, MC, MCC. For use in: Dairy products like acidified drinks (yoghurt, whey, buttermilk) or acidified desserts like yoghurt. By use of: e.g. guar gum, LBG, xanthan gum, starches (native, physically or chemically modified), carrageenan, proteins (vegetable, dairy or animal). For use in: All kinds of food in the dairy or savoury / deli sector. or natural emulsifiers like egg albumin, egg yolk (barn or free range), dairy (like caseinates, WPC, dried milk and whey products etc.) or vegetable proteins or protein isolates. For use in: Savoury products like soups and sauces, dressings, mayonnaise or in the dairy sector for aerated/whipped products, cream products. By use of: Gelatine, carragheen, lactems, starches, proteins, spray dried emulsifiers/compounds. For use in: Mousses, fillings,(cream) toppings, any kind of aerated product. By use of: Galactomannans (Guar, LBG, Tara Gums), starches, carragheenan, fibre. For use in: All kind of food products. By use of: e.g. Fibres (e.g. wheat, pea, citrus, oats), native and physically modified starches, pectins, proteins. For use in: Desserts and all kind of dairy or savoury products. By use of: Phosphates, citrates, carbonates, acetates, sulphates, chlorides, ascorbates. For use in: A broad variety of dairy or dairy ingredient containing products for buffering or for savoury products for shelf life or taste. 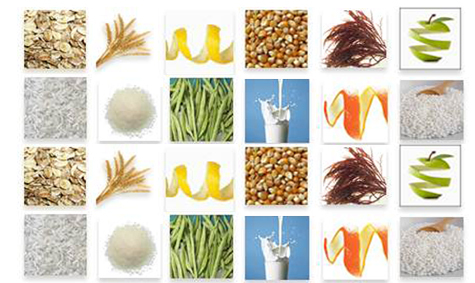 By use of: Caseinates, WPC, MPC, Milkpowders, milk/whey isolates, vegetable proteins/isolates. For use in: Particularly for yoghurts, desserts. All mentioned ingredients are available in many different grades, viscosities, particle sizes and also in organic quality as far as in compliance according to directive (EC) 834/2007 (no chemical modification, no GMO material). We have an implemented HACCP-system, strict allergen-management and all processes follow GMP and the requirements of IFS Food (6) and BRC Food (6) standards. It is self evident that our production site in Reinfeld/Wesenberg is GMO free.